Sarajevo, the capital of Bosnia and Herzegovina, is best known for the turmoil of war in Yugoslavia. But since then much has changed and Sarajevo has surfaced to become a vibrant metropolis full of life and cultural heritige. The unique mixture of Western and Eastern styles, the way of life, and the pleasent and good natured people is what gives Sarajevo its unique feel and that is why many people refer to Sarajevo as the city with a Soul. 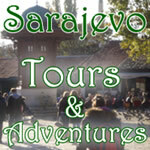 Sarajevo Guide will try and give you a glimpse of what Sarajevo is all about. We will take you on a journey through history and we will present you with a short preview of all the important attractions. You will experience Sarajevo in a new light when reading our nightlife guide. Moreover on our web you will also find all the information that would help you to plan an enjoyable and succesful visit to Sarajevo. Don't forget that here on Sarajevo Guide, you have an opportunity to book for accommodation, tours, adventures, and much more. For anything specific that you are searching for but can't seem to find please don't hesitate to contact us. Our team will try and answer all your requests. We wish you a pleasent stay whilst discovering Sarajevo!